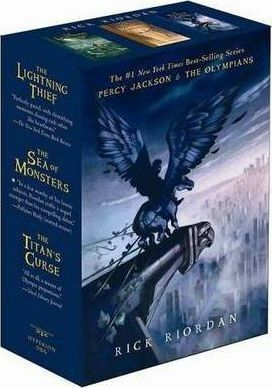 Percy Jackson and the Olympians: Percy Jackson and the Olympians Pbk 3-Book "The Lightning Thief" WITH "The Sea of Monsters" AND "The Titan's Curse"
Percy Jackson is a good kid, but he can't seem to focus on his schoolwork or control his temper. When his mom tells him the truth about where he came from, she takes him to the one place he'll be safe-Camp Half-Blood, a summer camp for demigods (on Long Island). There, Percy learns that the father he never knew is actually Poseidon, God of the Sea. Soon Percy finds himself caught up in a mystery that could lead to disastrous consequences. Together with his friends-a satyr and other the demigod daughter of Athena-Percy sets out on a quest to reach the gates of the Underworld (located in a recording studio in Hollywood) and prevent a catastrophic war between the gods. When Percy Jackson receives a distress call from his friend Grover, he immediately prepares for battle. He knows he'll need his powerful demigod allies, Annabeth and Thalia, at his side; his trusty broze sword Riptide; and... a ride from his mom. The demigods race to the rescue, to find that Grover has made an important discovery: two new powerful half-bloods whose parentage is unknown. But that's not all that awaits them. The Titan lord, Kronos, has set up his most devious trap yet, and the young heroes have unwittingly fallen prey. Hilarious and action-packed, this third adventure in the series finds Percy faced with his most dangerous challenge so far: the chilling prophecy of the Titan's curse.